The latest in the legendary Nod and GDI saga takes the series back to its roots, both in terms of gameplay and plotline. Are you ready for the answer to the Tiberium question? 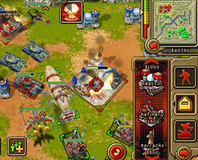 The ever popular Command and Conquer series will be exploding on to the 360. Let battle commence. Red Alert? Tiberian Sun? Generals? The series moves on with a new installment in the RTS, named Tiberium Wars.